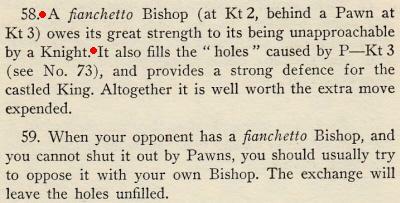 Outside of Italy, at least, we wonder whether ‘fianchetto’ was widely understood by chessplayers until the second quarter of the nineteenth century, by which time games featuring the manoeuvre were by no means uncommon. The section headed ‘The Fianchetto’ on page 266 of The Chess Openings by Robert B. Wormald (London, 1875) also concerned only 1 e4 b6. Later openings books gradually used ‘fianchetto’ more broadly, one example being Chess Openings Ancient and Modern by E. Freeborough and C.E. Ranken, various editions of which had ‘King’s Fianchetto’ for 1 g3 and ‘Queen’s Fianchetto’ for 1 b3, as well as ‘The Fianchetto Defence’ for 1 e4 b6 and 1 e4 g6. 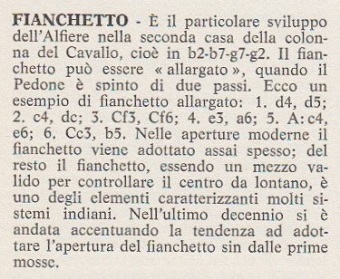 Some later volumes retained the Italian terms ‘Fianchetto di Donna’ and ‘Fianchetto di Re’; see, for example, page 3 of the fifth edition of The Chess Players’ Compendium by William Cook (Philadelphia, 1910). The above are, of course, merely jottings on how usage of ‘fianchetto’ evolved in English-language sources, and we shall be grateful for further relevant citations. On page 344 of the August 1927 BCM the following game annotation appeared after 1 e4 e6 2 g3: ‘“Everything gets fianchettised nowadays”, wrote Dr Tartakower a few years ago.’ Where did that observation first appear? Examples of chess instruction which have an original or unusual slant are always welcome. What is the longest gap in master play between a g- or b- pawn being advanced and the subsequent placing of a bishop on one of the ‘knight two’ squares? 1. (Descriptive): What is the longest gap in master play between P-Kt3 and the subsequent B-Kt2? 2. (Algebraic): What is the longest gap in master play between the playing of b3, b6, g3 or g6 and the subsequent Bb2, Bb7, Bg2 or Bg7, as the case may be? Bill Margolis (Laguna Woods, CA, USA) raises the subject of the English pronunciation of ‘fianchetto’. The OED incorrectly gives 1848. Latest update: 2 April 2016.